Lava can’t be stopped, so the best thing to do is just get out of the way. Hannique Ruder, a 65-year-old resident living in Leilani Estates, walks past hardened lava on May 11, 2018. A total of 15 fissures have opened in the residential community of Leilani Estates and Lanipuna Gardens on the east side of the Big Island. While the activity slowed Wednesday, there is still lava flowing underground, which has the potential to break through the surface almost anywhere on the east side between Cape Kumukahi and south to Kalapana, Hawaii County Civil Defense Administrator Talmadge Magno said. Toxic gases rise from cracks in Leilani Estates. When asked where an eruption might occur next, Jim Kauahikaua, a geophysicist with the Hawaiian Volcano Observatory, said, "It's very difficult to say since this thing [the intrusion] is miles long." "Why it chose Leilani Estates to erupt is not clear," he added. Magno told BuzzFeed News that the greatest concern is the population in the area becoming isolated by lava. "We need to get to it ahead of time," he said. While no fissures have opened on Highway 130, one of the major roads leading to the east side of the island, "the cracks are spreading" and getting wider, Magno added. The area is mostly residential, with some farms, boat ramps, and a rubbish transfer station, which has already been evacuated and closed. The Puna Geothermal Venture plant, which uses volcanic heat to make electricity, has also been shut down, and 60,000 gallons of highly flammable liquid was relocated. First Lt. Aaron Hew Len of the National Guard tests air quality near cracks that are emitting toxic gasses from a lava flow in Leilani Estates. High levels of sulfur dioxide gas are coming from the volcano, even in areas outside the evacuation zones. Hawaii officials are also monitoring the air quality at local schools, where students and teachers have been told to shelter in place should conditions worsen. Officials are also preparing for a possible ash plume if Kilauea's crater explodes because the lava lake in the volcano's crater is being drained as the fissures below relieve the pressure. If the lake recedes below the underground water table, moisture hitting the lava would create huge amounts of steam, building pressure that would cause an explosion of super-heated rocks. This aerial photo from May 6, 2018, shows the lava lake at the summit of Kilauea. In case of an ash plume event, the Hawaii Emergency Management Agency has instructed people to stay inside, close all doors and windows, and place damp towels along door gaps. "Uncertainty is sort of par for the course," Kauahikaua said of trying to predict volcanic activity. "It's always new." Whatever does end up happening, authorities say it's better to move out of the way of the lava rather than to try and block it. "We are not thinking about diversion," Magno said, noting that past attempts to stop or divert lava have been unsuccessful. In the 1960s, bulldozers were used to push rocks into big walls after Kilauea erupted and fissures opened up near the community Kapoho. "The lava would just go underneath, or go over, or move them aside," Magno said. While lava can be slowed, depending on the volume, ultimately "it doesn't do anything," he added. In the end, Kapoho was covered by lava. Sulfur dioxide can be seen filling the air around a fissure in Leilani Estates. In 1989, officials tried to save the Waha'ula Visitor Center at Hawaii Volcanoes National Park by hosing the lava down with water, but to no avail. "You need like one gallon of water per one square foot of lava to keep the lava at bay," Magno said. "But once the water stopped coming out, the building torched." 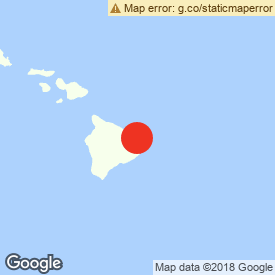 The visitor center was also adjacent to an ancient Hawaiian temple, a heiau, built in 1275, which officials feared would also be destroyed, but it survived that eruption when the lava stopped just 30 feet away. The heiau would go on to survive several other close calls, only to be quickly engulfed by a 1997 lava flow. "There's no realistic way" to divert lava, said Sgt. 1st Class Alan Peleiholani of the Hawaii National Guard. He urged people to stay informed and "just to evacuate." "You never know where she's going to pop up," he said, referring to Pele, the Hawaiian goddess of volcanoes. "You're just kinda clueless, and the best thing to do is evacuate until it's all safe." Pu’uhonua O Puna, a donation center in Pahoa, where people have been dropping off food, clothes, and money for residents who had to evacuate. A native Hawaiian who grew up on the east side of the Big Island, Peleiholani said he learned to respect the ancient gods and goddesses of Hawaii, including Pele, who has "a mind of her own." Peleiholani said his grandmother's home was taken in the 1984 flow in Kalapana, but that she "stayed there until the day that the house burned, cleaning the house and cleaning the yard to ensure that we do not leave any rubbish behind" for when Pele comes. The only way he has ever heard of successfully fighting lava is "when we brought a kupuna [a respectful term for the elderly and wise] to pray." "We know her power and have a higher respect," he said. "We try not to push our luck with her."